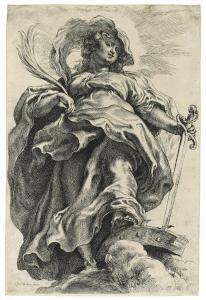 Find artworks, auction results, sale prices and pictures of Peter Paul Rubens at auctions worldwide. 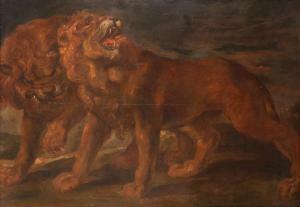 After Sir Peter Paul Rubens Two Lions Oil on canvas 128.5 x 176cm; 50½ x 69¼in This work is based on the painting now in the Louvre which was part of the original series by Rubens depicting the marriage of Maria de Medici and Henry IV. The original depicts putti riding the lions. For comparison see M. Jaffé, Rubens: Catalogo Completo, Milan 1990, pp. 274-275, cat. no. 725, reproduced p. 275. 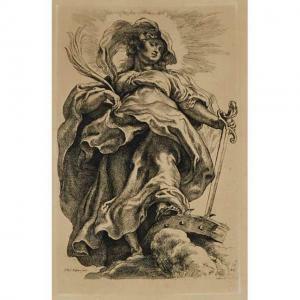 PETER PAUL RUBENS (1577-1640) Saint Catherine etching with engraving, circa 1620-30, on laid paper, without watermark, a very good, strong impression of the third, final state, with narrow to thread margins, the sheet corners and part of the lower sheet edge damaged and repaired, some pale time staining and pinpoint foxmarks Plate 296 x 198 mm., Sheet 300 x 202 mm. Provenance Charles Howard Hodges (1764-1837), Amsterdam (Lugt 552);. Staatliche Museen zu Berlin, Kupferstichkabinett (Lugt 1606), with their de-accession stamp (Lugt 2482); Ulrich Ochsenbein (1811-1890) and Alfred Ochsenbein (1883-1919), Switzerland; then by descent. AFTER SIR PETER PAUL RUBENS | Self portrait Description: dedicated on the reverse of the canvas: ' V Per L\’assistente' / ' R. Rossi' oil on canvas, unlined, unframed The present painting derives ultimately from Rubens' signed and dated self-portrait of 1623, in the Collection of Her Majesty The Queen in Windsor Castle (inv. no. 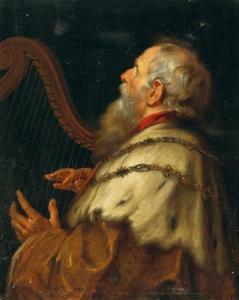 400156), originally painted for Charles I.1 A version attributed to Rubens' workshop, upon which the present copy may be directly based, is in the Uffizi in Florence (inv. no. 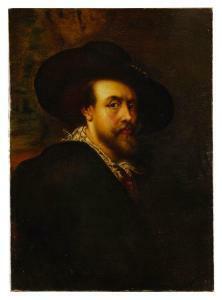 1884).2 1 https://www.royalcollection.org.uk/collection/400156/a-self-portrait 2 https://www.wga.hu/html_m/r/rubens/41portra/22sp1623.html Dimensions: Unframed: 84.8 x 61 cm. ; 33 3/8 x 24 in.